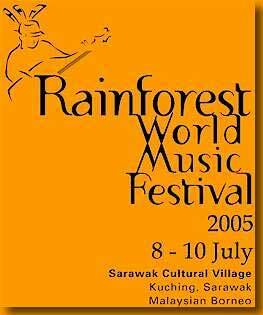 The 3 days festival is held at the Sarawak Cultural Village, a living museum where the traditional habitats of Sarawak's major ethnic groups have been lovingly reproduced. Shannon (POLAND) Celtic music from Poland? Absolutely! With bagpipes, fiddle, bodhran, uilleann pipes, kilts and all! Florencio Mess & The Maya Kek'chi Strings (BELIZE) A rare glimpse into ancient Kek'chi harp and string music from the tropical rainforests of Belize, through self-made instruments and the gentle soul of Florencio Mess. Yelemba D'Abidjan (COTE D'LVOIRE) A frenzy of drums and percussions mixed with balafons, songs, dances and masks with traditional rhythms from Ivory Coast, Burkina Faso and Guinea. Petrona Martinez (COLOMBIA) Colourful Caribbean Queen of the bullerengue, at 67 years old, with her family of percussionists and her very distinctive voice. Djamel Laroussi (ALGERIA) Exciting & catchy – a mix of Algerian rai with influences of jazz, blues, reggae. World beat at its most attractive. 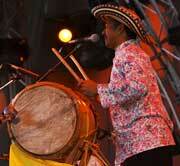 Tuku Kame (SARAWAK) Modern fusion of traditional Sarawakian melodies as well as the Malay joget and zapin. 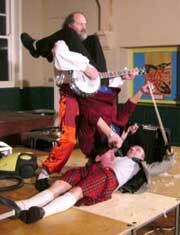 The Old Rope String Band (UNITED KINGDOM) Three men with a mix of mostly traditional music and mad comedy at its most vivacious and tongue-in-cheek. Chulalongkorn University Ensemble (THAILAND) Serene hypnotic music from the different regions of Thailand played on a large array of ethnic instruments. 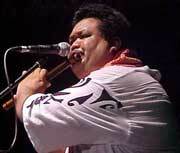 Jerry Kamit (SARAWAK) The lonely and mesmerizing sape music of Sarawak by one of the virtuosos of the instrument. 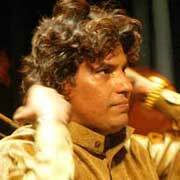 Faiz Ali Faiz (PAKISTAN) Powerful, spiritual and spine tingling - the new voice of Qawwali and highly regarded as the successor of the late and lagendary Nusrat Fateh Ali Khan. Namgar (MONGOLIA) Little known ancient music from Buryat and Mongolia which dates from the time of Genghis Khan and beyond"
The Foghorn Stringband (USA) Kick up your heels! Early bluegrass and square dance music from the South Appalachian and Mid-west region. Acquaragia Drom (ROMANIA) Who can resist the allure of wild gypsy music? Sacred and secular music usually heard at weddings and traditional feasts.